For a time, I was a special education classroom assistant at an elementary school with students that were mostly Mexican American and Polish American. There were a few African American students but not many. One day, I was sitting at the back of a 7th grade classroom and I overheard a conversation between a couple of nonblack students (I say nonblack because I don’t know their specific ethnicities). After I heard that, a million things popped in my head (and wanted to pop out of my mouth), but my blood pressure went down and I eventually realized that everybody makes or has made (before being born again of course) distasteful racial jokes at some point, including myself. That doesn’t make it right, but it’s the truth. America is experiencing a lot of racial tensions in light of the killings of several unarmed black men (and women, although not talked about as much) that have been killed by police. I just listened to a TED talk featuring diversity advocate Verna Myers called “How to overcome our biases? Walk boldly toward them,” in which she addresses these current events. She talks about the need to acknowledge our biases and confront them head-on in order to create better relations between black men and the rest of America. I completely agree with her, especially her belief that denial about biases can be dangerous. I would go further to say that believing that you don’t see race or any other ways that someone is different from you is dangerous. While I used to say, “I don’t like other people’s kids. Kids are mean.” I no longer feel that way (completely). Kids say what they think and often lack the tact or political correctness that most adults (hopefully) have. Even though I felt like turning over every desk in that classroom when I heard the “I’m black for the day” joke, I realized that at least this kid is not in denial about his ignorant stereotypes about black people. In this day, many people assume that we now have a post-racial society because we have an African American president. This couldn’t be further from the truth. This type of thinking will only lead to more dead unarmed black and brown people in the streets at the hand of an inherently racist law and justice system. Yet, only once all of us acknowledge that we are different from one another and actually EMBRACE those differences instead of fear or loathe them can our children live in a better America than we do today. If we try to act like race has nothing to do with why unarmed black men and women are being killed at the hands of police or while in police custody, we will never solve the many problems influenced by our collective racial history in America. I don’t believe that Rev. Dr. Martin Luther King Jr. meant for us to deny or ignore race, but called for us to not be judged by it. So it happened like this…I was giving the boogie baby a much-needed bath and she was playing with the tub strainer. Eventually, she threw it in the space between the tub and vanity cabinet-the land of no return. I smacked my lips and shook my head. The tub strainer really comes in handy since I’m known to clog up many-a drains while washing my thick hair. I tried for several long minutes to get it out. I used my hand as far as it could go (just a few inches), then my wide-tooth comb, then a long spoon from the kitchen. But, nothing. If anything, I only managed to push the tub strainer further into the land of no return. I was flustered. While I was stressed about losing something that only costs about $1.50 at Walmart, my toddler was happy as can be in the bath tub, proud that she was “brushing” her little teeth by herself. At that moment, I remembered a book I read in high school called Don’t Sweat the Small Stuff by Richard Carlson, Ph.D. Even though I don’t remember many of the specifics about the book, the title has never left my memory. There I was 10+ years later, sweating the small stuff. Sometimes when we’re just in the go-go-go mode (the life of a mom), we’re not thinking and most likely doing something that doesn’t have to be a priority at the moment. That brings me to my next point. 2) Ask myself if the task at hand is a priority. I am the type of person that doesn’t like things to be out of place. Even when I have things in a mess, I call it an “organized mess” because I usually know where things are when I need them. If I see a sock that goes in the dirty clothes bin, I tend to stop what I’m doing to pick it up and put it where it belongs. This is great except that it interrupts the task I’m already doing. Does that sock really have to be put away asap? No. 3) Make a plan for how to fix the “little” thing that’s making me antsy. After trying to get the tub drainer from the land of no return, I resigned to just pick up a new one on my next trip to the store. I made a note in my phone and kept it moving. No need to sweat about something so insignificant. Eventually, I probably will get the tub strainer from between the tub and the vanity cabinet, then I’ll have 2! I’m simply tired of the unnecessary stress that I put on myself concerning things that don’t really matter that much. I would love to hear about how you guys prioritize and maintain peace of mind on a day-to-day basis. Let me know in the comments! Real connections require vulnerability. It can be difficult to be vulnerable, to share raw emotion and present it to someone else unsure of what they will do with it. They may mend your open wound or throw dirt in it. You won’t know until you put yourself out there. Know that whatever happens after you reveal the real you, whether you are nurtured or hurt, you can handle it. Earlier this month, my husband sent me an article by Beth Kowitt from fortune.com featuring two videos about a woman that I really look up to, Mellody Hobson. Hobson is the President of a Chicago-based mutual fund company and investment management firm known as Ariel Capital Management, LLC and is pretty much a boss in every conceivable way. One of the many things I love about her is that she isn’t afraid to discuss the challenges caused by race and gender in corporate America. In the first video (found here), Hobson boldly proclaims that she has stopped apologizing for being black or for being female. I’m sure that any black woman that has been in either spaces where you were the only black person or the only woman or maybe the only black woman, you can relate to not wanting to make other people uncomfortable by pointing out your otherness. When I first saw this video, I nearly cried because it made me realize how I’d been apologizing not only for my race and gender, but for every part of me that made me different from those around me. In the second video of the article, Hobson talks about something that everyone can relate to, no matter your race or gender, which is the company you keep. Hobson talks about how the people around her make her want to be better, work harder, and think bigger. Everyone can relate to having at least 1 person (or several) around you that always has something negative to say whether it’s criticism of what you’re doing or complaining about their situation (without taking any responsibility for their own hand in it). For every two steps that you take forward, these type of people will pull you one step back. When I decided to be positively optimistic and powerful, I made a pledge to myself to be the type of friend that I want to attract and to put myself in social environments with people that I want to be like. It is up to us to become the type of people that we can be, but we can’t do it surrounded by people that want us to stay the same. My (imaginary) mentor talked about a host of other things in this article so I highly recommend reading the whole thing, but that’s all I got so until next time, stay POPPED and hold it down. I don’t know about you all, but when I’m really hungry and tired, every little thing that goes wrong seems like THE WORST possible thing that could happen. Sunday morning, I basically jumped out of bed and drove to the grocery store to get a few items for breakfast while my husband stayed home with our toddler, L-boogie. When I got back home, I was completely wiped out and so hungry that I felt weak. Then, it happened. The WORST thing that could happen at that moment. Mind you she’s a little too old to still be walking around with a pacifier, but that’s a different issue for a different day. I went into STRAIGHT PANIC mode. All I wanted was a couple slices of bacon and a nap. But those desires seemed impossible if my daughter did not have her pacifier while taking her nap. I absolutely needed her to take a nap and take it willingly. After frantically searching the entire apartment with no luck (going through closets, looking in the freezer), I stopped and exhaled. I picked her up, kissed her cheek, and told myself that it would be ok. In that moment of calm (and after eating a few bites of her scrambled eggs), it dawned on me where the missing binky would most likely be. L-boogie loves to do what we do and she most likely saw Daddy put clothes in the dirty clothes basket after he took a shower. I lifted up a bath towel from the top of the basket and whatdayaknow!!! There was the binky I’d been looking for, more valuable than money, gold, or Haagen-Dazs ice cream at that moment. I said, “Look at God” to L-boogie and felt extra silly for getting so worked up when it was right there all along. But most of all, I just felt grateful. This blog is the result of a major shift in my thinking, which took place a month or two before I turned 26 (my golden birthday I might add). 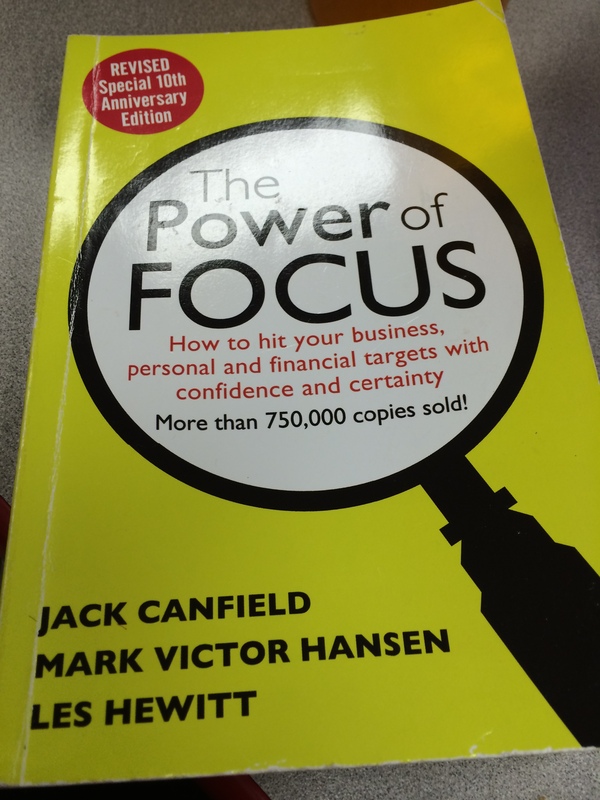 It’s hard to remember the exact moment when I got popped, but the impetus had to be reading The Power of Focus (see pic below) for the first time. I’d always read personal development here and there-an article or short book from time to time. Yet, before reading this book, I still struggled with negative thought patterns and a lack of confidence. For some strange, divine reason-maybe it was just the right time-The Power of Focus knocked me straight to the floor (not literally…I think). It made me realize that it is ONLY ME that has the power to change the things in my life that I don’t like. Unknowingly and sometimes knowingly, I realized that I blamed other people, childhood experiences, depression, being black, being female, [insert any other excuse] for not living the life and being the type of person that I’ve always wanted to be. All of those excuses stopped when I got popped. Popped=the action of becoming a positively optimistic and POWERFUL black woman. This blog will give you the very best from my brand-new personal development journey and the goal is for you to get POPPED and stay POPPED.